With Christmas just around the corner and the end of the year in sight, I thought I would put a selection of my favourite photos together from some of the weddings I have photographed over the past year. Pour yourself an eggnog or mulled wine and sit back for a few minutes to take it all in. Thank you to all the couples I worked with this year, I hope the photographs I have created give you many happy memories for years to come. I recently asked a few of the couples I photographed this summer if they would write a piece for my blog about their wedding day. I wanted it to be in their own words as if writing a diary entry not just about me their photographer but the build up to the day and the day itself. “For me, the wedding ‘day’ really started the night before! 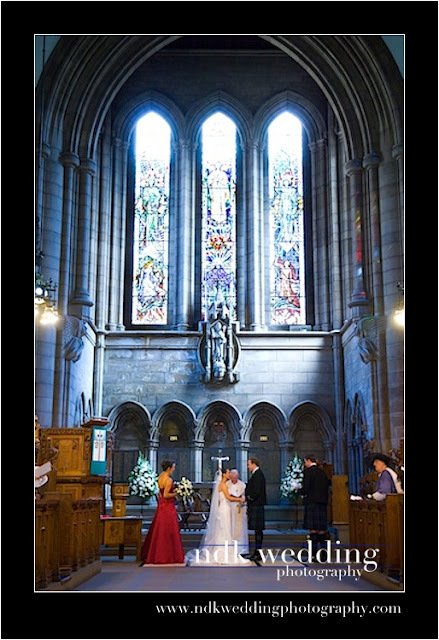 We had arranged a get together of friends and family the night before at Cottiers on Hyndland Street and this is where the excitement really started building for me. There were a number of people there who I hadn’t see for many years and having all of these friends in one place gave Niove and I a great feeling for the celebration lying ahead. After a moderately early night and waving goodbye to my future wife for a few hours, the wedding day thankfully dawned bright and sunny. The best man and I were up early and diverted our thoughts via breakfast and an hour at the gym. I hear that preparations weren’t so relaxed across at the Indigo Hotel but the hotel was apparently very good and a good base for a number of family guests from Greece. 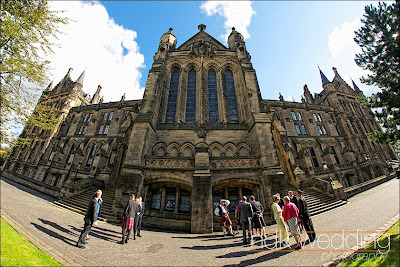 We had decided to get married at Glasgow University Chapel, partly for family reasons and also because we are both graduates of the University and felt that the atmosphere and feel of the Chapel would give our day the special feel that we wanted. 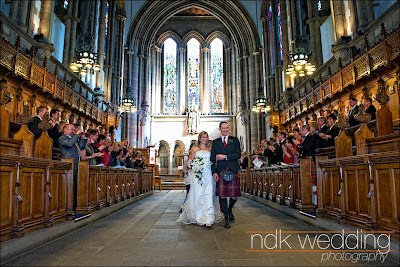 It is a beautiful building both inside and out and I have to say that it was a very special feeling waiting for Niove at the head of the aisle. Now, I’m not a football supporter but it turns out that the University chaplain, Rev. Stuart Macquarrie is, so the best man and I were receiving regular, excited reports on Rangers’ progress in the first Old Firm fixture of the season. 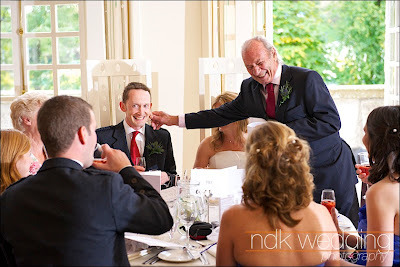 Rev Macquarrie was fun to deal with throughout the wedding preparations and on the day itself he made sure that we were as relaxed as possible with some well timed jokes and stories. Neither Niove or I are particularly keen on being the centre of attention but walking down the aisle together was one of the most memorable moments of the day – I think we both felt very proud just at that moment, and also a little bit of relief that the service passed without any hitches. The only potential hitch then arose immediately afterwards when Nearly fell down the steps of the Chapel after catching a heel on her wedding dress. 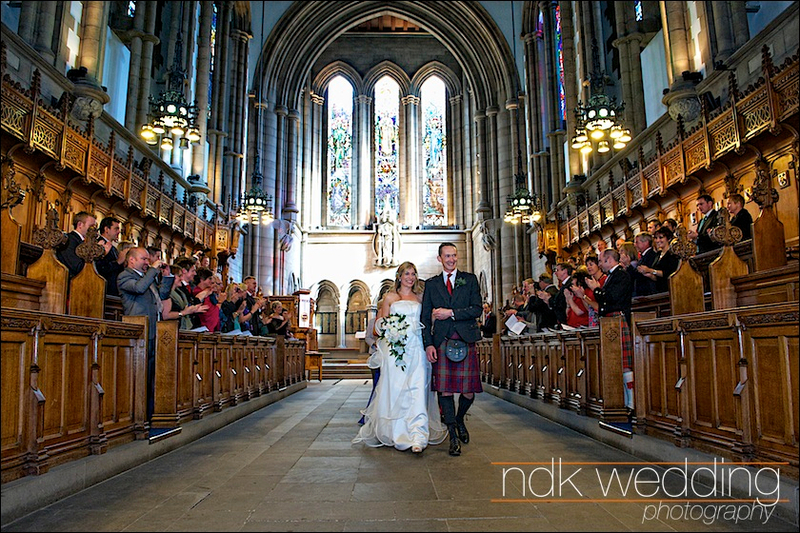 Thankfully she held on to me and most people were still in the Chapel so any damage was limited to the absence of a perfect “walking down the steps” photo! After Nick took some great group photos in the University cloisters we made our way to House for An Art Lover for the reception. We’d arranged cars and a coach for our guests via Doigs and I’d highly recommend them – new cars and the surprise of a trip home after the reception in a beautiful Bentley Continental. House For An Art Lover, in our view, is a great venue for a wedding of the size we had – circa 90 guests in total including 15 / 20 evening guests. We’d heard good reports of the venue and the food and neither disappointed. The reception was well managed, the rooms looked perfect and the food was excellent. We’d agreed with Nick that he would mingle during the reception and then take some more formal shots at sunset following dinner. 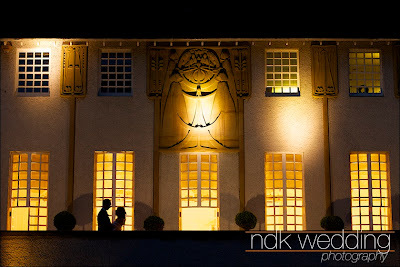 The shots that he took of us in front of the House are some of our favourites of the day and really reflect the beauty of the location very well. Rather than being formal, the evening reception was pure fun – catching up with friends, speaking to others who we hadn’t had the chance to chat with during the day. We had hired a band, “Hitched”, who could perform both pop and ceilidh numbers and they kept the evening very flexible adjusting the tone of each tune as needed to keep the dancefloor busy and everyone involved. This was key to the type of evening Niove and I had wanted and I have to say that we were particularly impressed with the way in which they dealt with our impromptu requests and kept everyone dancing. The one piece of advice I have regarding the whole day is do not underestimate how quickly it passes. It is one of the most special days of your life and you must make sure that you take time to soak in the atmosphere and the fact that all of these friends and family members have gathered to celebrate your big day – it is a bit of a cliché but make the most of it and enjoy every second. 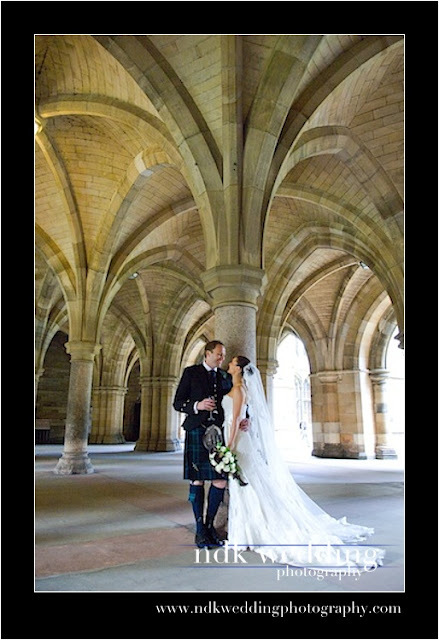 When I originally met with Annette and James, they had plans to wed at Linlithgow Palace, however their plans had to be changed and they chose Glasgow University Chapel instead. A great choice from a photography point of view as we had a bright day outside that created dramatic lighting inside through the fantastic stained glass windows. Before they headed off to Oran Mor for their reception, we managed to take some pictures in the Cloisters area of the University, that created some great informal portraits. 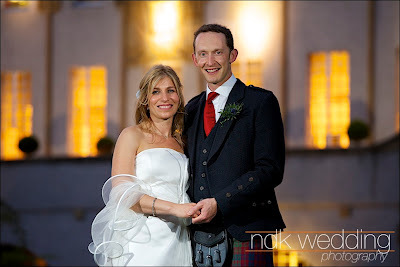 If you would like to discuss your wedding photography requirements, please contact me for a chat.